Charming totally renovated three bedroom cottage located in a great neighborhood within 5 minute walk to a beautiful ocean beach. 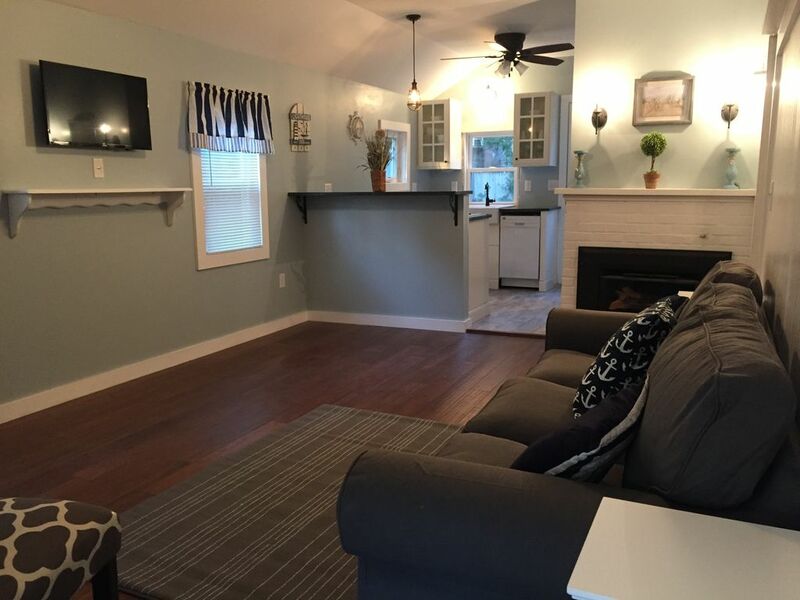 Brand new kitchen, bath and renovated with the true feel of a Cape cottage. **Linens and towels are not provided. ** Also walk to Seaview Park that has a playground , tennis courts and walking trails. Walk to restaurants and the famous Sundae School shop for their homemade ice cream. The quaint little town of Dennisport is only minutes away with art studio, antiques, cafes and an organic food store. Parking for two cars only. Come enjoy all the Cape has to offer. State/local taxes of 12.45% will be added after July 1. Great cottage! Wonderful location and owner easy to reach and very responsive. Restaurants in area excellent! Super friendly people. Highly recommend this property. Very clean! This is a wonderful little cottage! It was very clean and had enough space for everyone. It’s a perfect location in Dennisport and a short walk to the beach! Erica I’m so glad you enjoyed our cottage! Thanks so much for your kind review and for staying with us. We hope you can visit again! The cottage was immaculate and you could tell had recently been renovated. Perfect size and was a short walk to a great beach. Location on the Cape was fantastic, central to many popular tourist areas. My wife, two sons and I all had a wonderful stay. Everything feels recently updated & well maintained. The owners responded promptly to any questions we had prior to our arrival and we had no issues during our visit. We were able to take advantage of wonderful weather, with the short walk to the beach, and proximity to the rail trail (there is also a decent playground and park with trails right between the beach and the cottage). I even did some night time surf casting and threw back some small bluefish. Dennis port has a nice down town as well that’s a short bike ride away. All in all, we will certainly be visiting again and thank the owners for making our memories possible. Dan I’m so glad you and your family enjoyed your stay- you and your family were so nice and friendly. Memories are what vacations are all about and I feel honored that you had them at our cottage. Thank you so much for staying with us and I do hope you can visit with us again. Just lovely: clean, updated, well-appointed with a great location! This was just the right place for our weekend away from home! One quibble (and it may even have been my fault--like maybe I missed a note in the property listing information), but you do need to bring your own sheets and towels. This just meant a more involved packing job on the way out and a good deal more laundry upon the return home. But the cleaning fee is very reasonable, there are beach chairs and clothes line in the back for drying the beach towels, and the owners were totally clear about what we needed to bring once we booked as well as quick to answer our questions. They also provided great info about beach access and area restaurants. Clean, beautiful, perfect location! Couldn't be happier! Excellent property, great location, quiet street, updated, and clean. Perfect size 3 bedroom, comfy beds, and every important appliance. Path in backyard offers a great shortcut and another path down the street as well avoids the busy streets nearby. We loved our week here and will be back again next year!